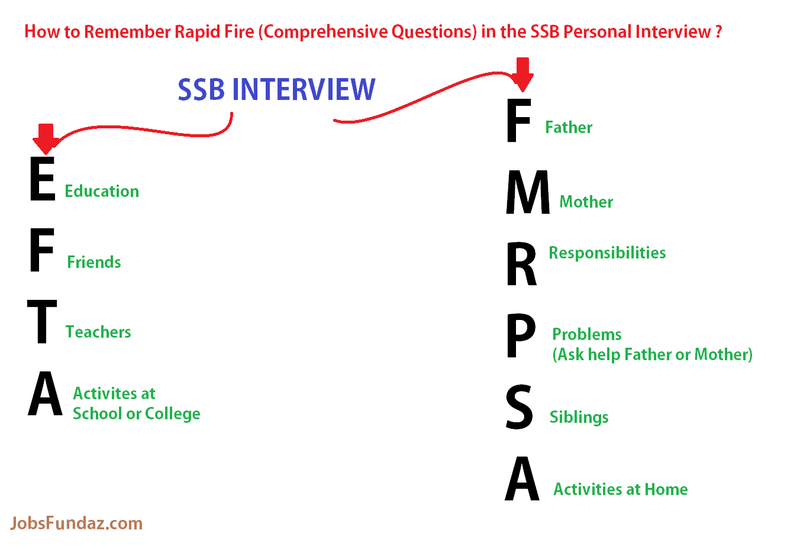 How to Remember Rapid Fire (Comprehensive Questions) in the SSB Personal Interview ? 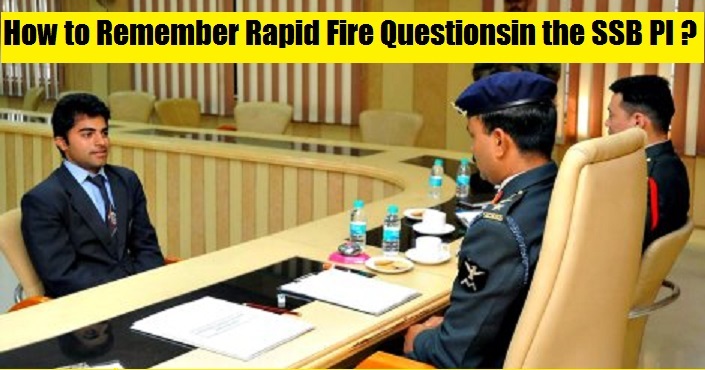 Hello Aspirants, In this article we will be discussing about the mostly asked question by the candidates who have been to SSB Personal Interview that How can they remember the rapid fire questions also called as comprehensive questions in the ssb personal interview. 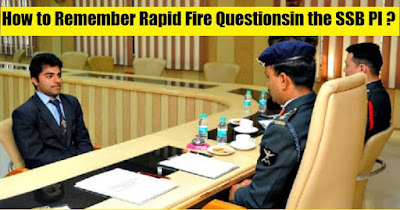 Rapid Fire questions are the series of questions asked in the SSB Personal interviews. So Checkout the complete article given below and get the best tips on how you can remember rapid fire or the comprehensive questions in the interview.Feel free to ask your doubts in the comments below will get back to them. Rapid Fire or the Comprehensive Questions are the series of Questions which are asked by the interviewer to the candidate. This questions are asked to create a stress like situation on the candidates to see how he reacts on this questions is the candidate remembers the sequence does he answers all the questions or he gets confused he keeps quiet. Simply its a bundle of questions on certain topic and IO will ask all the questions related to it which will be all about your personal life and from the PIQ. Questions consider about your Education, Friends, Teachers, Activities at school or College this is the first part which will be asked all about your education life then the next series of Questions all about family like about your Father, Mother, Relation with them, Problem solving, Responsibilities at home, siblings, activities you do at home and some more questions around your personal life will be added. The reason of this questions is to check how much you are aware of yourself and the people around you. So many candidates have problem how they can remember the questions which are asked in series as they are asked very fast and you need to be too attentive which he asks the questions. So for this we invented a small method through which it helps you to remember the question in series and you can answer them easily without and hesitation and with confidence. In the below image you will find two sides where written EFTA and FMRPSA this are the two sets which is usually asked by the IO in the SSB interviews so you just need to remember the short form that is EFTA and FMRPSA full forms to this you can check in the image below through which you will come to know about the questions you need to answer also you need to be attentive which questions he has not asked and you dont need to answer to that question. For Example:- IO are very smart some times they will ask you questions from backwards and skip some of them like he skips about siblings you dont need to tell him about siblings this will show you have mug up the questions just be attentive which questions he asks we have showed you some tricks to which you can remember the questions that may be asked in the interviews. Also some times some more questions may be asked in this if you are working you may be asked about your Job, about your office friends, your relation with them, working atmosphere, how you spent your salary. If you have still not answered all the questions its not that you have not performed well and if the IO wants you to answer for the question which he wants to check your personality with he himself will ask you the question or you can politely ask him for the questions you left with a smile on your face. So this was all about How to Remember Rapid Fire (Comprehensive Questions) in the SSB Personal Interview ? Hope now you know how to face the SSB interview confidently and remember all the questions asked by the interviewer. This were some ways through which you can remember the questions asked by the interviewer. Feel free to ask questions in the below comments regarding How to Remember Rapid Fire (Comprehensive Questions) in the SSB Personal Interview ?. 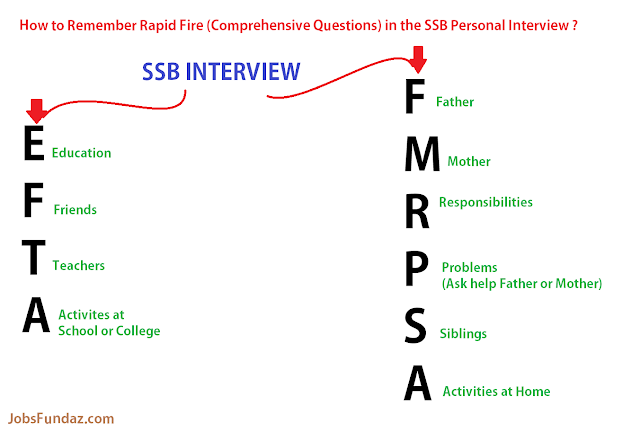 Labels: How to Remember Rapid Fire (Comprehensive Questions) in the SSB Personal Interview ?